A user is selected for the Monthly Subscription Scheme based on the user's past transactions. This scheme would want the user to pay just 100 Pts for the month which will allow them to use the application for rides for whole month. 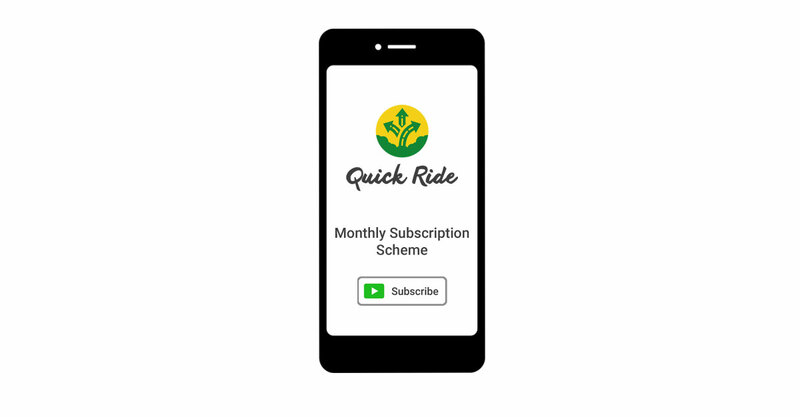 ● A user have been selected for the Quick Ride monthly subscription scheme., as we found the user is violating Quick Ride payment terms. ● It was voluntary either to subscribe and continue using services or skip using Quick Ride. ● Under this user need to pay one time 100 Pts for using Quick Ride service for one month. ● A user have chosen to Subscribe services by paying 100 Pts, which is non-refundable/ can't be reversed. It was voluntary and user chose to subscribe to continue using it. ● If user continue to use Quick Ride and make all transactions through Quick Ride account, the service fee collected by Quick Ride throughout the rides successfully completed by the user will get refunded back to user's wallet for the month up to 100 Pts, at the end of subscription month. ● If user continue to use Quick Ride account and don't deviate/violate the terms, the user need not to renew the subscription for next month and renewal is purely based on the current month transactions on Quick Ride App.